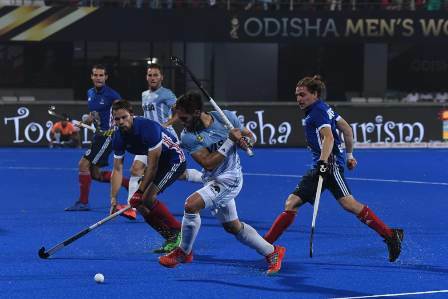 ONI Bureau: Although Olympics Gold Medalist Argentina lost to France 5-3 in the Pool A game at Kalinga Stadium, Bhubaneswar tonight, they still qualified for the Quarterfinals as the Group Winner. France and New Zealand, which held Spain to a 2-2 draw in the other match, will fight it out in the crossovers and need to win against their opponent to seal a berth in the Quarterfinals. Spain is out of the Hockey World Cup 2018, as it finished at the bottom of points table with no win, 2 draw matches and a loss. In the match between France and Argentina, Hugo Genestet (18th minute), Victor Charlet (23rd minute), Aristide Coisne (26th minute), Gaspard Baumgarten (30th minute) and Francois Goyet (54th minute) scored the goals for French team. For Argentina, Lucas Martinez scored in the 28th minute, while Gonzalo Peillat scored in the 44th and 48th minutes. Hugo Genestet of France was declared ‘Player of the Match’.